Last week, we highlighted the Cleveland Hearing & Speech Center’s Community Center for the Deaf and Hard of Hearing. We want to make sure you’re able to get a better understanding of the services that your team and individual donations support. This week, we’d like to highlight the audiology team at CHSC that has over 60 years combined experience working with people of all ages, from infants and toddlers to adults and seniors. The team provides thorough evaluations, rehabilitation and education to help maximize clients’ hearing health. Hearing and Hearing Loss – There are many solutions to hearing better, and the audiologists at CHSC are dedicated to connecting you to the solutions that are best for your hearing loss, lifestyle and communication needs. Our clinicians not only provide the most advanced affordable technology, they also emphasize your education about hearing and communication strategies that are most effective for you. Our efforts each day are centered around helping you stay connected to and communicate with family, friends and co-workers. Hearing Testing – The audiologists at Cleveland Hearing & Speech Center can test the hearing of individuals of all ages from birth to older adults. Our testing is completed in a sound-treated booth to ensure accuracy and includes having a person respond to both sounds and speech. The testing process also includes an examination of the ear canal, a test of the health of the middle-ear system and a comprehensive case history. Auditory Processing Testing – The audiologists at Cleveland Hearing & Speech Center can complete auditory processing testing on individuals 7 years of age and older. If your child has a diagnosis of another disorder such as autism, low cognitive ability, attention deficit disorder or language delay, it may be difficult to test for APD, as these diagnoses may be related to weaknesses in the auditory system. Hearing Aids – The audiologists at Cleveland Hearing & Speech Center are here to guide you through the hearing aid selection process and will help you find the best hearing aids for you and your lifestyle. Other Listening Devices – An assistive listening device (ALD) is any type of amplification device that can help you communicate more effectively. ALDs can be used with or without hearing aids and can improve hearing in the presence of background noise or listening on the phone or to television, as well as improve hearing at a distance. When you use these devices, you may notice less stress and fatigue in addition to improved hearing. You should consider using an ALD if your hearing aids do not provide enough help in certain environments or if you don’t wear hearing aids but need help hearing only in one or two situations. Noise and Hearing Conservation – According to the National Center of Disease Statistics, 5.2 million children between the ages of 6-19 years have hearing loss directly related to noise exposure. The Occupation Safety and Health Administration estimates that nearly 5 million Americans work in levels of noise that are potentially harmful to their hearing. Noise-induced hearing loss (NIHL) can be instantaneous and caused by just one single exposure to a very loud sound (like a firecracker or gunshot). NIHL can also be caused by cumulative exposure to loud sounds which gradually build over time to cause the hearing loss. So, even though hearing loss due to loud sound may not always be evident immediately, NIHL may be present later, in teenagers or adulthood. Any reduction in the overall lifetime noise “dose” will be good for hearing in later years. On behalf of Cleveland Hearing & Speech Center and its clients, thanks for your help! You are the heroes that allow us to continue providing these types of services to those who need the assistance. If you have any questions about these services, please feel free to contact us. Click here to donate to one of the participating teams in this year’s Cleveland Big Wheel Relay. Thanks in advance for your support of our mission! 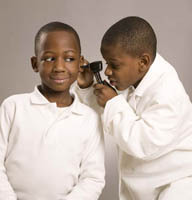 Next Next post: May is Better Hearing & Speech Month – Help Us Support CHSC By Making a Small Donation!